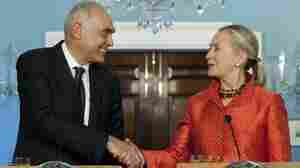 Outspoken Ambassador To Syria Returns To U.S.
October 26, 2011  U.S. Ambassador Robert Ford has been brought home from Syria because of fears for his safety. His very public criticism of government repression and his expressions of support for protesters — attending the funeral of a slain activist, for example — have brought threats. The United States accuses Syria's state-run media of inciting violence against him. 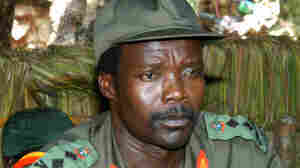 Joseph Kony, leader of the Lord's Resistance Army, in a 2006 photo. The Obama administration has sent 100 troops to advise militaries in Uganda and neighboring countries that are battling Kony's forces. October 25, 2011  Human Rights groups are offering widespread praise for a U.S. decision to send military advisers to help combat the Lord's Resistance Army, a rebel group accused of repeated atrocities in Uganda and surrounding countries. October 24, 2011  The State Department has withdrawn Ambassador Robert Ford from Damascus, citing threats to his security. Ford has angered the Syrian government for repeated forays around the country to show solidarity with peaceful protesters. 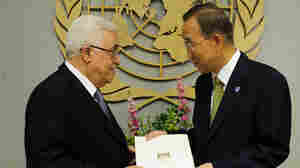 Palestinian Authority President Mahmoud Abbas (left) hands a formal letter for Palestine to be admitted as a state to U.N. Secretary-General Ban Ki-Moon during the 66th General Assembly at U.N. headquarters in New York, Sept. 23. Palestinians now are pursuing full membership in other U.N. agencies. October 19, 2011  As their U.N. membership bid languishes, the Palestinians are applying for full membership in another U.N. agency. The bid to join UNESCO as a full member complicates matters for the U.S., which provides about 20 percent of the agency's budget. 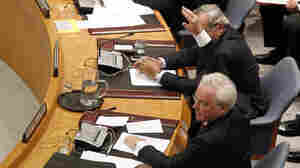 Palestinians Try Alternate U.N. Route, Worrying U.S.
October 15, 2011  This week, a Syrian-American was indicted in the U.S. on charges he passed information about dissidents back to the country's intelligence services. It's not an isolated incident; Western diplomats and law enforcement officials are stepping up efforts to discourage Syria from intimidating dissidents abroad. October 12, 2011  A day after announcing they had uncovered an Iranian terror plot, the Obama administration is moving quickly to try to drum up more international pressure on the Iranian regime. But some Iran watchers are raising doubts about the U.S. storyline — and wonder if the U.S. can get the sort of diplomatic mileage it wants out of this case. October 12, 2011  Humanitarian groups are increasingly worried about the looming budget cuts in U.S. foreign assistance. 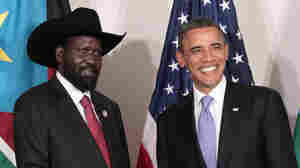 They argue that lives are at stake in places like the Horn of Africa, which is suffering its worst drought in decades. Raising public and private money for the crisis is a challenge in the current economic environment. Vitaly Churkin, Russia's permanent representative to the UN, vetoed a Security Council resolution Wednesday condemning Syria for its brutal crackdown on pro-reform protesters. The vote set off a public rebuke from Washington. October 8, 2011  The Russian veto of a watered-down U.N. Security Council resolution on Syria was not a shining moment for the Obama administration's "reset" of relations with Russia. It's the latest indication that Russia and the U.S. are far apart on major world events of the day. October 7, 2011  Three women share the Nobel Peace Prize, the Nobel committee announced Friday: Liberian President Ellen Johnson Sirleaf, Liberian Leymah Gbowee and Tawakul Karman of Yemen. The committee honored their "non-violent struggle for the safety of women and for women's rights to full participation in peace-building work." October 5, 2011  The U.N. Security Council has failed to agree on what to do about Syria's brutal crackdown on anti-government protesters. Tuesday night, Russia and China vetoed a resolution condemning Syria, even after the text was watered down and stripped of any threats of sanctions. Protesters shout slogans against the Syrian government in front of the White House in July. A new report from Amnesty International documents more than 30 cases of Syrian activists living overseas whose activities have been monitored and whose families in Syria have been threatened. October 3, 2011  Syrian exiles have been harassed and monitored at anti-government protests abroad, and their families back home have been threatened, beaten and detained, according to a new report by Amnesty International. As a result, some activists say they are keeping a lower profile. September 29, 2011  The U.S. relationship with Egypt was closely linked to the 30-year presidency of Hosni Mubarak. Now that he's gone, the relationship is sure to change. Will U.S.-Russia Reset Survive Putin Presidency? September 28, 2011  President Obama has invested heavily in a "reset" of relations with Russia. 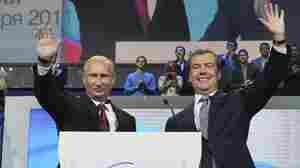 But some believe those ties could be strained if Vladimir Putin again becomes Russia's president. Will U.S.-Russia Reset Survive A Putin Presidency? September 25, 2011  The new nation is in need of a major development program. There is also a lot unfinished business in the peace process that divided Sudan into two, along with new accusations that South Sudan is supporting rebellions in its northern neighbor. September 24, 2011  The U.N. Security Council now has before it an application from the Palestinians to join the United Nations as a full member. The U.S. is promising to veto the bid as diplomats try to revive Israeli-Palestinian peace talks, but as NPR's Michele Kelemen reports, the parties sound very far apart.